A 58-year-old female patient presented with right posterior heel pain for 6 months. The pain was at the distal heel and hurt the worst in the morning with the first few steps. After 10 minutes of ambulation, the pain would subside. Consistently, pain occurred with any direct pressure to the area, such as laying the heel on the bed or any supporting surface and accidently bumping it. She described the pain as a searing, burning pain that would throb for a while after any incident. There is no history of injury and the patient had well controlled Hashimoto’s disease. Otherwise, she was very healthy and active, doing yoga and hiking 3 to 4 times per week. A clinical exam revealed point tenderness at the Achilles tendon insertion of the right heel, at its most distal attachment. No swelling was noted. No pain or palpable nodules were noted along the Achilles tendon. Dorsiflexion of the ankle was 10 degrees with the knee extended and 14 degrees with knee flexed b/l. She had a slight pes cavus. ROM of all joints was free of crepitus and pain. Muscle strength was 5/5 for all lower extremity muscles. The rest of the exam was unremarkable. Gait exam was unremarkable with no early heel lift noted. X-rays, which included the AP, MO, and lateral views, were unremarkable (see Figure 1). 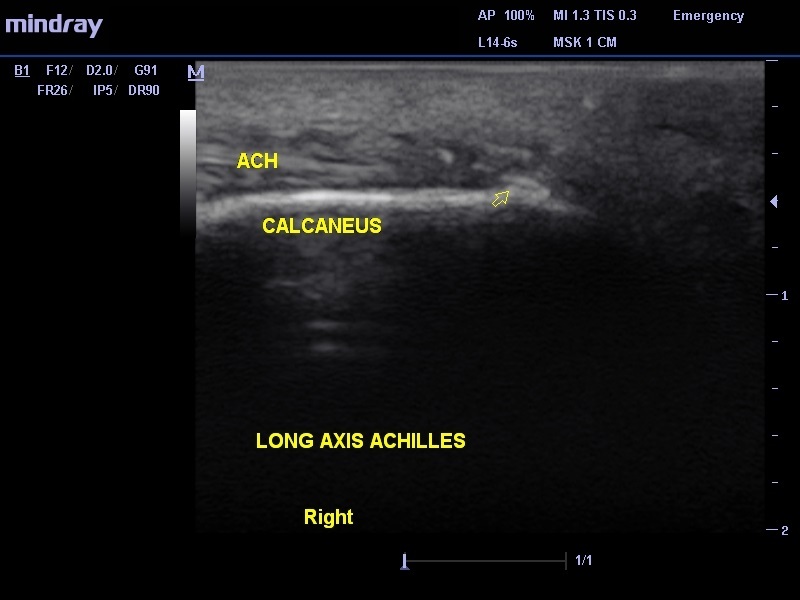 Diagnostic ultrasound with 12 meghertz frequency and 1 cm depth was done to assess the posterior right heel with specific attention to the Achilles tendon. I concentrated on the long axis view (sagittal view), which is always my initial preferred view (see Figure 2). This allows me to look at the tendon from the musculotendinous junction to the insertion and provides me a nice view of the bursa and the posterior calcaneus. The patient’s Achilles tendon was normal in regard to architecture, size, and form. The bursa was unremarkable. 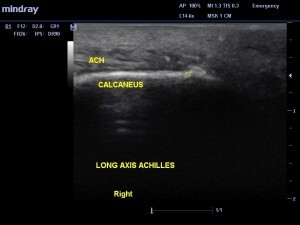 The posterior heel at the distal Achilles insertion showed an anechoic area. This could be inflammation or anisotropy (which is an ultrasound artifactual anechoic area caused by lack of the ultrasound beam hitting the tendon at 90 degrees). This happens at areas of boney attachment because the tendon dives deep. It is critical here to rock the probe “heel to toe” to resolve the possible anisotropy. If the anechoic (black) area does not disappear, it is inflammation. In the patient’s case, it was inflammation. Also, the ultrasound showed calcification (hyperchoic) and early spurring. This focal area was exactly the area of pain and that pain was elicited with probe pressure. Figure 1. 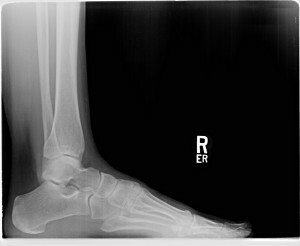 Lateral X-ray view of the right calcaneus with no posterior spurring noted. Ultrasound in this case showed early heel spurring before radiographic signs were seen. It also confirmed that the Achilles was normal, with no tendinosis or tearing. This exam took 5 minutes to do and yielded vital clinical information that helped streamline treatment.